Our product range includes a wide range of cone crusher, impact crusher hammer mill, vertical shaft impact crusher, laboratory jaw crusher and stone crusher. 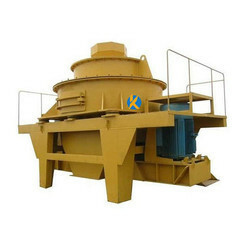 Cone crusher is widely used in metal and non-metallic mines, cement, construction, sand and metallurgical industries. It is applicable to materials like iron ore, nonferrous metal ores, granite, limestone, quartzite, sandstone, pebbles and so on. Cone crusher crushes materials by working between the movable cone and fixed cone. The movable cone is supported by spherical bearing and fixed on an hanging erect shaft which is set in the eccentric sleeve, and the sleeve is set on the stopping and pushing bearing. The movable cone and erect shaft is driven by the eccentric shaft sleeve together. The eccentric shaft sleeve is driven by horizontal shaft and fimbriated gear, and the wheel of the conveyor belt is driven by motor through v-belts. The lower part of vertical shaft is installed in the eccentric sleeve. When the eccentric sleeve of cone crusher rotates, there is a conical surface lined out by the shaft. When the movable cone comes near the fixed cone, rocks are grinded into pieces, when the cone leaves, grinded materials is discharged from the discharge hole. The fixed cone can be ascended or descended by adjusting setting to adjust the width of discharge hole, consequently the output size is determined. The Impact Crusher Hammer Mill is used for primary, secondary and fine crushing of all kinds of stones and rocks with compressive strength less than 350 MPa such as granite, marble, and limestone. 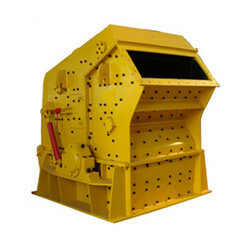 The Impact Crusher is widely used for sand and rock production in the industry of roads, railways, reservoir, electricity power, building materials and so on. Sound construction and high efficiency. When the crusher works, the motor drives the rotor to rotate with high speed, on the rotor where installed the hammers. When the materials get into the area which the hammers effect, under the impact function of the hammer at a high speed, the materials are thrown to the impact device above the rotor continuously. And then the materials are rebounded from the impact liner to the area where the hammers effects for being recrushed. The materials from large to small all to be crushed at the impact chamber repeatedly. The process won’t stop till the material are crushed to the required size and then discharged from outlet. VSI vertical shaft impact crusher is a newly researched equipment, with international advanced level. Technology and modern processing equipment make it a leading role in this industry. VSI vertical shaft impact crusher is designed for highway, railway, high-rise construction, municipal, hydroelectric dam construction, concrete mixing stations to provide high-quality sand and gravel aggregate, it is artificial sand and stone shaping field preferred device. Raw material falls down into feed hopper, then enters impeller through central entrance hole. It is accelerated in high-speed impeller, then is thrown out at speed of 60-75m/s. When hitting impact plate, it is crushed. Final products come downwards though outlet. 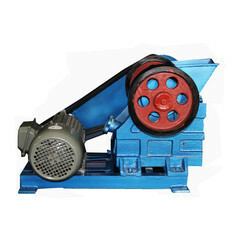 Two Jaws Are Provided In This Laboratory Jaw Crusher. The Moveable Jaw Produces Two Blows For Every Revolution, Thus Reducing Over Sizing To A Minimum. A Combination Of Forward And Downward Strokes With A Rocking Action Exerts Pressure On The Coarser Material, And Permits The Finished Material To Pass Through The Jaws. 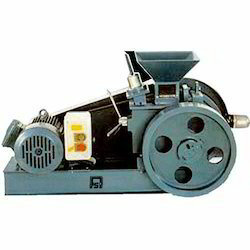 PRIMARY JAW CRUSHERKANDI MINERAL TECHNOLOGIES PVT LTD Jaw Crushers are the preferred choice for various applications like aggregate, iron ore, coal, cement and other mineral sizing operations. Jaw crusher is a kind of heavy duty machine which can crush materials into even granularity and has the characteristics of high reduction ratio, high productivity, simple structure, and reliable performance, etc. Our jaw crushers are convenient to operate and are of reliable performance and ideal for critical crushing operations due to simplicity of design and rugged constructions. A wide range of KANDI MINERALS Jaw Crushers models are available, making it highly flexible for project planning. 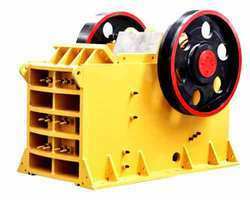 WORKING PRINCIPLEJaw crusher consists of frame, eccentric shaft, belt wheel, flywheel, movable jaw, side guard plate, toggle plate, toggle backseat, gap adjusting screw, returning spring, fixed jaw plate and movable jaw plate. Toggle plate is also used to guarantee the security. Jaw crusher uses electric motor as the motive power. Eccentric shaft is driven by triangular belt and wheel, which makes movable jaw make reciprocating motion. Materials in crushing chamber (consists of fixed jaw plate, movable jaw plate and edge plate) are crushed and the finished materials are discharged from discharging hole. Grease lubricated spherical roller bearings and labyrinth seals - Jaw Crushers are equipped with top quality grease lubricated bearings and seals. Safety of Single Toggle Jaw Operation - The safety toggle plate provides complete jaw protection from any un-crushable and ensures a proper nip angle is maintained. Electric Hydraulic Adjustment (Available in select models) - Jaw Crushers are equipped with hydraulic shim adjusters including hydraulic oil jacks, shim plates and other components. Large Crushing Ratio Production - Jaw Crushers have larger and deeper crushing chambers and the crushing angle is designed to be sharp for a very high crushing ratio.